It’s one of those modern life fears we’ve all encountered at some point in our professional lives: going to access your data and it’s gone. Your throat tightens, your eyes bulge, your stomach drops, and you go into full-on panic mode as you attempt futile reasoning with your computer or server. You hope that your frantic keyboard smashing and power button pressing will somehow bring the device or drive back to life and all will be well (at least long enough to get your data off it), but every passing moment inches closer to the inevitable. You call tech support for the product but they tell you there’s only one way to fix it and that’s to send it away to a company who specializes in data recovery but warns the cost is not cheap. So you come to a crossroads: how much is your data worth to you? Something similar happened to us about two years with our server. Long story short, two of our archived drives (set as a RAID-1 configuration and designed to be hot swap-able once they were full) stopped being accessible after we attempted to reinsert them into our server to gain access to the content. Hours of tech support (across weeks of time) with the server manufacturer, led us to being told “it will be impossible to ever get the data off the drives”. That’s just what you want to hear in a situation like this. We attempted pulling all the drives out of our 12 drive array and reinserting the drives back in by themselves, even trying to put them in different bays to see if we could get any response. The server would occasionally recognize a drive but would never properly mount it. So, I took the drives to my Windows OS edit station to do more research. When mounted, the drives would show 5 separate partitions but require them to be reformatted in order to gain access. 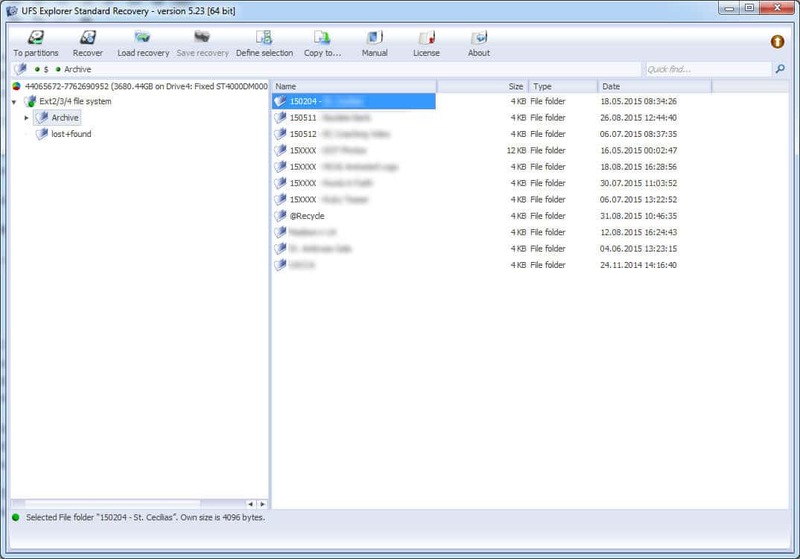 The drives show up inside Windows Disk Management as “RAW” requiring a format to properly use. Additionally, they show as being RAW formatted, which is the default a Windows OS will display for Linux-based “ext2” or “ext3” formated drives. My days in the IT world kicked into gear and I started finding ways to recover the drives manually. Using off the shelf software is usually a hit-or-miss situation when it comes to data recovery. Only in rare scenarios will a piece of software be able to fully recover data from a corrupted or damaged drive. And that’s what the first three days worth of scans were showing me. 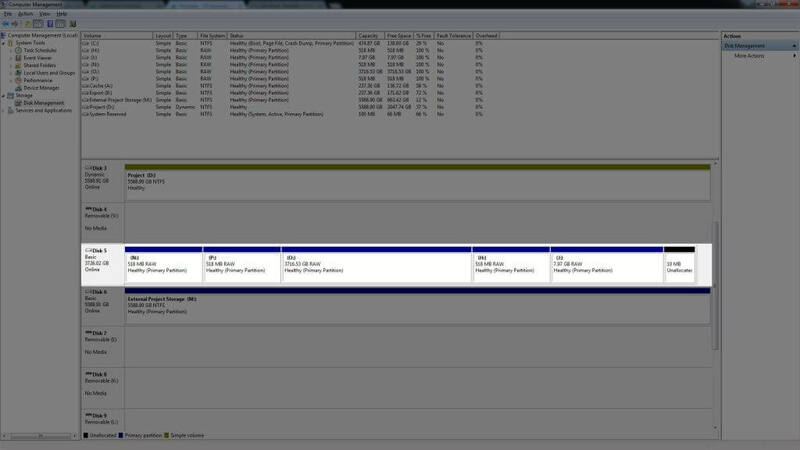 Additional research had showed me that the largest partition is where the data would have been stored on my drive. Trying software such as “GetDataBack”, “NAS Data Recovery”, and “Recuva”, all showed promise by finding and recovering some of the files on the drive. After 10+ hours of scanning, I was only able to recover around 90GB of files. 90GB from a 4TB hard drive. To make matters worse, the recovered files were broken and corrupted, and named generic file names like “WordDoc28810.doc”. Around the time this drive was created, we had started shooting in 4k RAW format, which outputs individual .DNG files for each frame of a take. Some shots that last for 15 seconds could have thousands of individual image files that need to be put into the correct sequence in order for the video to play back correctly. This generic naming was not going to work, or at the very least would be a giant nightmare to reassemble. And thus enter the depths of the internet as my saving grace. While searching for answers online, I found a user who had suggested using a piece of software called “UFS Explorer Standard Recovery” to view the files on a corrupted Linux drive. 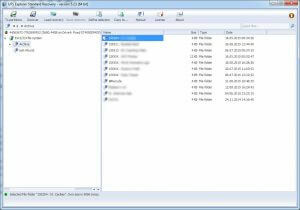 I have never used a piece of recovery software that was so easy to use immediately after installation. Instead of having to do a long 10+ hour scan, the software recognized all the drives plugged into my machine and asked me which I wanted to explore. Choosing the large partition of my “irrecoverable archive drive”, I clicked on the “Explore” button and was immediately presented with a Windows Explorer-esque view of all the files on the drive. All my folders, all my files, everything properly named and not corrupted. All I had to do was select the folders and right-click choose “Copy To…” to save the files to another drive. I had all my files back in a few hours (the speed it would normally have taken to copy from one drive to another). EDITOR NOTE: This was set up on a hardware raid in a QNAP server. According to QNAP and every other resource we could find, the hard drives should not be recoverable outside of the hardware raid. Despite that, Jeff discovered that you can recover a hard drive set up in a raid array on a QNAP server!